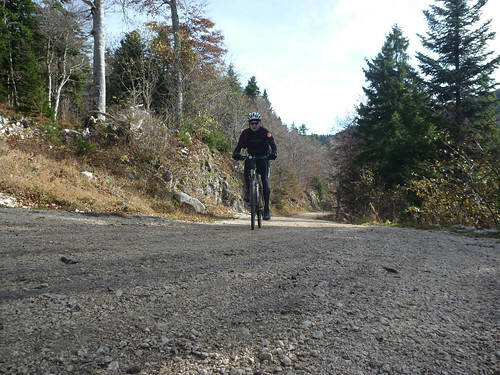 At the risk of repeating myself, the Jura mountains are an incredible place for steep, big, beautiful, deserted cycling climbs. This route requires a non-road bike. From St-Genis-Pouilly, it starts with a paved climb to Tiocan – and great views of the alps. From here we joined a gravel, muddy, not too steep, forestry path that runs along the Juras – about half way up – for more than 10 kms. Lovely stretch. 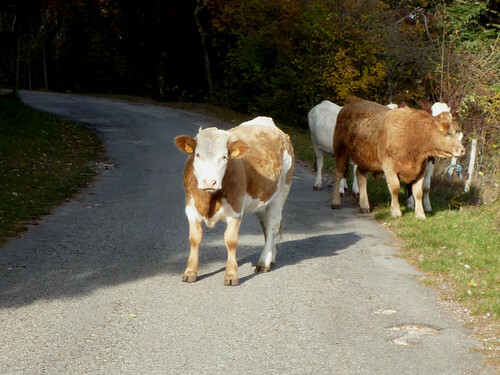 Then we turned up, joining the road to Col du Sac. The last couple of kms are steep, hairpinned, but fun. I insisted on visiting the Col sign for Col du Sac. And then Eric showed me the gravel road over the top. We have gone over Col du Sac before, but on difficult trails. 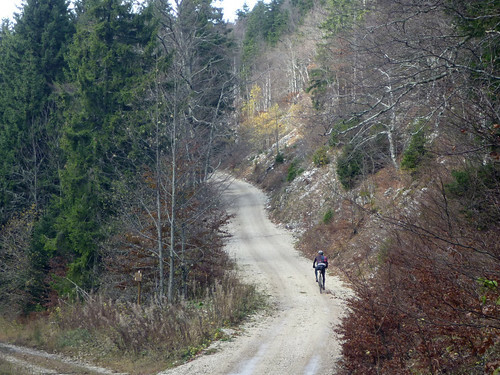 But, the mapped route, takes an occasionally steep, but full-sized (completely deserted) gravel road over. 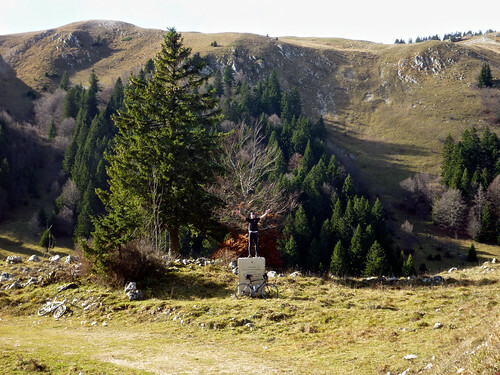 The stele at Col du Sac commemorates the recent building of this Sylvo-Pastorale road. This is code for a road built buy the French government with the expectation that almost nobody will use it. On the other side, above Col de Menthières, we explored a little, taking a nice path around Cret d’Eau (the main peak here), rewarded with great views of the Alps, and other big Jura climbs like Col du Grand Colombier. Tired but satisfied legs meant we doubled back, but one could easily make a nice loop by riding over Col de Menthières and then returning to Geneva via Col de la Faucille. Vous avez vu, au Tiocan, en continuant tout droit et en prenant la 1ère à gauche, il y a une piste qui semble en très bon état et qui mène à une ferme (“La Capitaine”) dans les alpages à presque 1400m. A essayer un jour pour la belle vue que l’on doit avoir là haut.